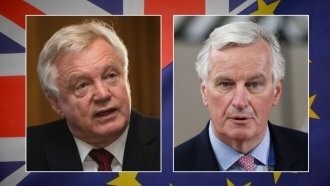 Negotiations are taking longer than expected between the U.K. and the European Union. After more than 40 years of economic and political agreements, a breakup is hard. The U.K. and the European Union are learning that the hard way: This week's Brexit talks ended in a "deadlock." "They are discovering, as we are, day after day new problems. That's the reason why this process will take longer than initially thought," European Commission President Jean Claude Juncker said Friday. Money is the key reason for the holdup. Juncker said the U.K. has to pay a so-called "divorce bill" before talks can move forward. But, he continued: "I'm not in a revenge mood. I‘m not hating the British." The EU is asking the U.K. to keep its commitments to pay for part of the bloc's longterm projects. The U.K. is reportedly looking to get out of those pledges as much as possible. The divorce bill's amount depends on the negotiations. Some European estimates place the bill between 60 and 100 billion euros. By contrast, British Prime Minister Theresa May previously proposed a 20 billion euro payout. In addition to money, talks are stalled on the rights of EU citizens living in the U.K. and the effect of a new international border in Northern Ireland. The council needs to agree that sufficient progress has been made on these issues before moving on to talks about trade, which are expected to be even more complex. The official split is set for March 29, 2019. But both parties need to reach an agreement pretty soon to make sure there's time to ratify it. A delay in talks could worry European businesses whose jobs and investments are affected by the split. Without an established trade deal, both sides could face tariffs on exports. 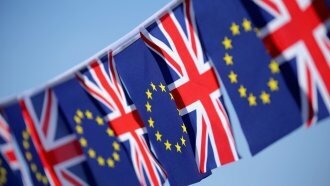 The U.K. has been pushing to start trade negotiations as soon as possible. But the EU's chief negotiator said he hasn't seen enough progress in current talks to recommend moving to trade just yet. A European Council meeting later this month will decide the next steps for the deal.